The original Chibi-Robo for Gamecube was a rare gem that was as fun as it was innovative. Unfortunately, it didn't receive the sales it deserved and it always made me sad to think we may never get a sequel. A few years later, though, we got lucky with the announcement of a DS version of the franchise. Residing in the lofty shadow of its predecessor may make it easier to criticize the flaws it has, but this is only because there was such promise inherent in the concept. Nonetheless, Park Patrol tries its hardest to find its footing and does a decent job of it. Chibi-Robo: Park Patrol is a videogame wrapped up in a quaint environmental message. Apparently Nintendo wants you to know about that fact, since the press release accompanying the launch of this title made note of this alongside their partnership with Wal-Mart. But the reality is, there isn't much depth there - you go around growing flowers, which is obviously good for the planet, but that's the extent of what the game teaches you about protecting the environment. Otherwise, unless I missed the news about being able to bring plants to life with the power of dance and music, that's the long and short of it. This is not exactly Al Gore's Inconvenient Truth. What's more, some of the things the game has you doing is kind of counterproductive to the theme... often you'll be smashing open garbage bags and recycle boxes, but it never has you clean up after yourself. Odd, to say the least. In order to start your planetary do-gooding, you'll eventually be given a water sprayer, a radio, some clippers and a spoon. The process works like this: you find a sprout that has not yet grown, you spray it with your water spritzer, and then you breakdance with your radio to make it flower into brilliant colors which in turn tosses out more sprouts for you to grow. After a certain number of sprouts are grown in each plot of land, it'll turn into a magical fertilized garden which lures in park visitors, which is basically the whole goal of the game. You'll be able to make different color sprouts, which you can clip to sell to the flower salesman for happy points. 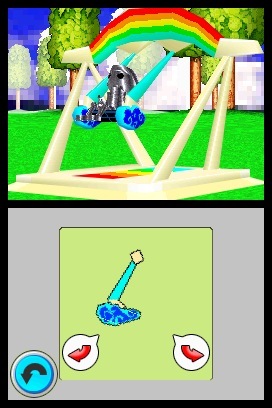 Almost every "good" you do nets you these happy points and they, in turn, can be used to develop your park and your chibi-robo as you see fit. The underlying system of the game, what makes this a challenge at times, is the everpresent danger of running out of energy - you are a battery run robot, after all - and the threat of smogglings. The battery issue is a easy enough thing to fix... simply run to the nearest socket (most of the time in your home base, but there is a socket in town and you can create a windmill and other things which you can plug into for a quick charge). The smogglings, however, are always causing trouble by turning your flowers black and dead, which are no good at all for your visitors or your park. You can take out the smogglings using your water spritzer, but they'll constantly return until you beat the game. You'll even encounter bigger and badder smogglings which can be a real hazard to what you've worked so hard to create. To help you create a better park, you can elist the aid of various toys which will build utilities, attractions and mini-games. They're where this game is most similar to its predecessor, as they are accompanied by charming little stories. For the most part, none of it is at the level of the storylines surrounding the Sanderson's rocky family life in the original, but they manage to keep things interesting and compel you forward. Francois, for example, is a puppet who loves freedom and liberty, but ironically is bound by the strings that he is attached to. Pop and Fizz are two penguins constantly arguing about who should get top billing in the partnership, and watching them bitchslap each other over and over is amusing to say the least. But when you solve their problems, they'll join your fight to protect the environment and you'll be able to send them on various building operations ranging from fountains to making sand fertile for plants. Unfortunately, the game is handicapped by some rather serious setbacks. The controls are a combination of d-pad and touchscreen, which is at best awkward and at worst unwieldy and imprecise. Being that you control Chibi-Robo on a 3D landscape it would almost feel like an early generation PSOne game if it wasn't for the fact that you're sliding the stylus up the screen to spray your water and ride your bike. You can string together flower grows in a combo, and while the game does its best to 'auto aim' you in the direction of the nearest plant, so often you'll be spraying the air due to the awful directional controls which will prevent you from connecting the combo. I feel like we've gone far past this era of gaming, and it's definitely not enjoyable to return. Fortunately they did not add any platforming (a big part of the original game), because although that was a great feature it would have not worked at all with this system. Even more disappointing is that the "grind" of growing flowers begins to get extremely repetitive around three or four hundred large, and you'll find yourself almost dreading returning to the park for the next battle with smogglings and string of plant growth. There's simply not enough variety here to stretch throughout the entire length of the title. The little mini-games that you can build are a feeble attempt at extending your enjoyment of the title, but it does not last very long. The visuals also leave a bitter taste, because while they surprisingly managed to get the scale right everything else is squarely in the "ugly" camp - unattractive landscapes, limited draw distance and color schemes are married to the limitations of the DS technology with horrific results. 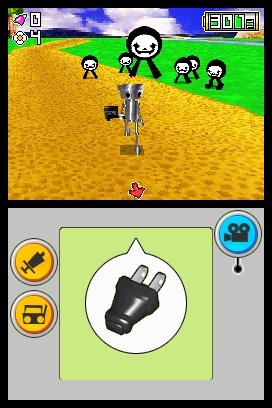 Chibi-Robo: Park Patrol tries its hardest to find its niche, but while it has a subject appropriate to the Chibi universe and a concept fittingly original, it is held back in too many places to claim to live up to the standards set by Skip in the earlier title. And even on its own merits it manages to be fun for a little while before wearing out its welcome long before the end. It's a fine rental at most, but you can spend your 30 bucks better elsewhere on the DS. What's Hot: The same cute Chibi action. He breakdances!